On the 23rd of January, the great Hermann Botolen hosted a sublime dinner featuring the best from Gerhard Fuchs' cuisine at Weinbank, paired with some outstanding wines from Burgundy's most famed Domaine. The always charming Christian Zach was the man in charge in front of the house. 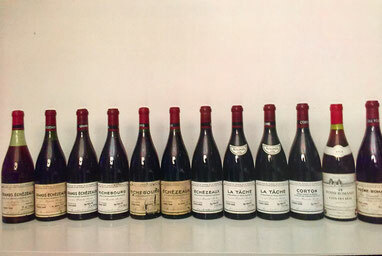 A truly memorable evening with fine wine, fabulous food and great wine people! Richer, riper nose, giving, poppyseed character, fine, lively and lots of concentration! Youthful, fine, restrained, elegant poppyseed backbone, fresh acid, great finesse, elegance but lots of vivacity, reductive style, young vintage, cool climate wine. Nearly Chablis-ish at first, great tension, salty element, what a persistent length. This is truly a fine wine! Long haul! Rather youthful nose going into a developing stage; forest floor, fine, fresh acid structure, balanced, great concentration of the fruit, still dominated by the aging regime! Ripe, developed nose, forest floor again, dark red fruit character, ripe, finesse and elegance, great tension and structure but very much at its peak, lively acid backbone. Med/long finale! Very ripe in the finish. Developed, ripe, horse saddle, smokey, tar, ripe acid structure, full bodied, a bit flabby but for this age, showing fantastically! Restrained, rather quiet, refreshing acid structure, long haul, structure, very pointed and elegant. This is riper, fuller but denser! Richness paired with ripe acid structure! Fullest body so far but still refined! In all, however, below Echezeaux! Charming, giving, lots of texture, good vibe, ripe acid element, fullish but still focused. Riper, developed nose, ripe acidity but there is grip, tension through tannin and tightness! Has a long life ahead! 1989 Richebourg DRC - Wine of the evening!!! Intriguing nose, lots of layers, fabulous, this is very fine indeed, lots of tension, great acidity, fabulous density, great texture, long. A multilayered example of fine red Burgundy. Youthful, fine, filigran, smokey, refreshing acid structure, a bit hard on the finale. Rather uncharming. Youthful, delicate but dominated by the maturation in the cellar, floral, singing, fine, present, a bit masked by the wood, there is lots of potential. Still young! Needs time! This is massively youthful, tension is there, fabulous structure, restrained, elegant, drinking really well, long haul! Still young, only slightly developing; this is nervy and has structure as well as tension, there is a great sense of purity. Reduced, reductive, seductive nose, dark red fruit core, tight, dense, full bodied, fine, crystal clear red fruit character, massively youthful, long haul, fine and long! This will be superior in 10 years time! Brighter colour element, fine, restrained, refreshing acid element, slightly herbal element, developed, tangible, tight acid in the back, mid/long finish. Grandeur, refreshing, great acid element! Lots of structure and great grip, fabulous finale. Fine wine indeed! Tight acid element, fabulous structure, still youthful in the nose at first but fast developing in glass, lively and vibrant!!! Going towards Maggi after some time! A nervy wake-up call at the end of the night with layered yellow fruit accents in the nose. On the palate, crisp acid structure along with lots of weight and depth, still on the elegant side. Persistent, refreshing finish!